How do you know that fuel prices are getting out of hand? Even military pilots can't afford to take the plane these days. Capt. Ace would rather fly than do anything else. During high school, he worked after school and weekends to pay for flying lesons. He spent one year flying pipelines in Alaska and two years stunt flying for movies before enlisting in the USAF. 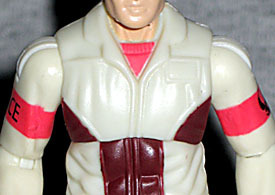 He joined the GI Joe team after serving in pilot combat training school as a senior instructor. He's right at home in the cockpit of all types of planes and has an intuitive knack for getting the most of them. Ace has been around since 1983, but he isn't exactly the most recognizable Joe on the team - he's more known for his ride, the iconic Sky Striker jet. That thing was all over the place, and he was the primary pilot, so he's probably been in some of your favorite adventures, even if you don't know it. And although "Ace" may sound like a pretty standard pilot's callsign, it actually doesn't have anything to do with his flying: he loves high-stakes poker, and is nearly unbeatable at the table. This figure has an original body, but like many in the line, it's designed for future re-use. That means there aren't a lot of sculpted elements that directly match the original figure, but the paint does a very nice job of drawing parallels. His flight suit is off-white, with dark burgundy panels on the knees, hips and up the center of his torso. Grey stripes run down the outside of his legs, and he has red bands around his biceps. 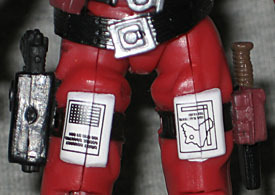 He's wearing a removable harness, which means you can make any of your Joes a pilot for a day! Ace's only acessory is a large dome helmet, with a wide clear visor in the front. It's got an oddly-placed molding seam, which can be distracting, but the face inside remains unobscured. The helmet actually snaps to the neck pretty well, so it won't fall off during any barrel rolls. With the helmet off, Ace looks like a pretty clean-cut young man: he probably got that haircut to help make people he plays cards against think he's just an easy mark. Wild Weasel learned his trade flying for Cobra operations in every hemisphere in which the evil organization has conducted its corrupt business. His knowledge of close support aircraft ranges from jerry-rigged civilian conversions to state-of-the-art flying weapons platforms. A mouth injury inflicted during a strafing run is rumored to be the cause of the characteristic sibilance in his speech pattern. As wild and unpredictable as his code name, he'll buzz his own guys just to cause some trouble. Once again, it's time for another installment of Fun With Bio Text! Whoever wrote this one for Hasbro (adapting Larry Hama's 1984 original) has gifted us with the non-existent phrase "jerry-rigged." "Jerry-built" means something was made shabbily from the beginning, "jury-rigged" means something was temporarily repaired with odd materials, but there's no such thing as "jerry-rigged." Thanks, lazy copyediting! You make life a hoot! Le sigh. Enough of that! Wild Weasel didn't have a lot to do in the cartoon, but he made a name for himself by, well, making a name for himself: he stood out among the Cobra ranks by having an animal-themed name that had nothing at all to do with snakes; it actually comes from Air Force terminology for aircraft specifically tasked with locating and destroying enemy anti-aircraft emplacements by allowing themselves to be targeted by the SAMs (surface-to-air missiles), then following the radar lock-on back to its origin. Crazy, huh? Wild Weasel is wearing a red flight suit, which is a much better choice than the original toy, which looked to be wearing a red leisure suit. There are small zippers on his pantcuffs (probably so he can get them over his boots easily), he has a holster on his right leg and a knife on his left, two belts, a harness with two big pouches on the chest, pockets on his sleeves, and black gloves. There are documents strapped to his thighs, probably so he can see them easily while he's flying. There's a Cobra symbol painted on his shoulder, but the placement of it means it's half under the torso at all times; it really should have been lower, near the elbow. The figure's distinctive helmet is a new mold, of course, and offers something no Wild Weasel ever has before: a glimpse of the man behind the mask. You can pop off the black visor and see the skin around his eyes. That's pretty nifty. It's implied in the comics that Wild Weasel is deformed in much the same way that Snake-Eyes is: that bit in his bio about his sibilant speech means that he has an odd hissing lisp from being shot in the mouth. Kind of like 50 Cent, but worse. Both figures come with their faction's respective display stand, and share the same articulation: balljointed head, shoulders, elbows, torso, hips and ankles, swivel wrists and double-hinged knees. These are the redesigned TFAC/G3 bodies, which add a bit of range to the joints: specifically, the elbows bend further and the legs can come up straighter in the front - nothing major. Wild Weasel is the only one of the pair to get a weapon: the gun that fits in his holster. 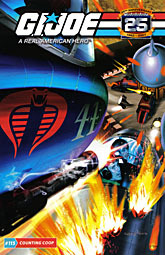 The pack includes a reprint of GI Joe #115 with a new painted cover by Greg Horn and all internal references to Marvel excised. It's a good story (other than the fact that Slipstream is referred to as "Dogfight" for the entire second half, a problem that comes from the origial book), but it's a pretty terrible choice. Yes, both Ace and Wild Weasel appear in it, but not at the same time, and only for about two pages, each. Maybe the folks at Hasbro just grabbed the wrong issue? It's possible they were thinking of GI Joe #34, an issue which not only features these two facing off against one another, but is also considered one of the best issues of the comic, period. Oh, and the lazy copyeditors strike again, right on the cover, where the story is identified as "Counting Coop," while even a cursory glance at the first page (or, you know, a dictionary) will tell you that it should actually be "Counting Coup." Ough. Of course, typographical errors shouldn't be enough to keep you from buying a set if the toys are any good. And in this case, yeah, they are. Of course, if you'd rather wait for versions of these pilots that, oh, I don't know, actually come with their planes, no one would blame you.